It was nearly five years ago when tens of thousands of people gathered in Jena, Louisiana to demand justice for six Black males. I witnessed that rally and it was filled with a sea of young Black people who had mobilized like never before. It was called the "new civil rights movement." Following the reporting of New Orleans activist and writer Jordan Flaherty, my reporting in The Final Call became an intricate part in spreading the story nationally and globally. I recently spoke with the 22-year-old Mychal Bell, who was a part of that high-profile “Jena Six.” He said he sees the killing of Trayvon Martin building similar support that he and others witnessed years ago when people occupied the small town of Jena.“It’s really tragic what has happened to Trayvon and how this has been handled. It just goes to show that racial profiling and racism within the justice system is still around," he said. Mychal and five other Black teens were being charged with attempted second-degree murder stemming from a school fight with a White classmate in 2006 after three nooses were found hanging from a tree at Jena High School. The historic case came to a close in 2009 and all of the ex-defendants are free and in school. Despite opposition, naysayers and his own personal battles, Mychal is a junior physical therapy major and football player at Southern University in Baton Rouge, La. He said he will be graduating in 2013! That's awesome news. As a biracial, single mother (of a multiracial son)- living in a community very similar to Jena- I THANK GOD Bell, and the other 5 boys, made it out of Jena, and did so alive! If the crimes committed by the white population (whether adults or kids) would have been handled in the appropriate and lawful manner they should have been... there wouldn't have been the racial tension, anger and animosity that caused the title Jena 6 in the first place! I commend Bell, the other 5 of the 6 and the parents of these boys for taking up yet another racist battle in the name of our children, justice and freedom. It is true, too, what they say about the southern U.S. still having deep-seated racial issues. Not only do we live in a southern state (so, I know it to be the case here), but we have friends and family in other, southern states as well (who tell us, it is like that where they live). Most white people don't see this disparity, because... unlike minorities (anything other than white), they don't LIVE it. I will guarantee you one thing: if one of their children was attacked, mistreated or called an evil (racist) name, you can be SURE that they would be calling for justice! I believe this to be true; injustice has continued against the African-American People of Color since slavery ended and slavery of a different kind began. When other Americans that know the truth refuse to come out and support Blacks that have been accused of a crime or crimes for fear of reprisals or plainly because they are racist, where is the justice in America? When police officers refuse to tell what really happened in a crime and the criminal justice system refuses to find justice for African-American People of Color, what does this say about justice in America? The darker Africans were brought to this country in chains; and since the inception of slavery against those Africans in this country, this has been our country. We died here and then we were born and raised here; we purchased land here, build homes here, work here, went to school here and we helped to build this country, paid taxes here; and many of our people died in the wars for our country. Though there are many who act as if we were born in the wrong country, this is our country, this is my country. Yet when it comes to justice here in America it’s almost like the welcoming committee withdraws their support; we are made to feel unwelcome in our own country. When speaking out against injustice, my book “Born In The Wrong Country,” targets hypocrisy, racism, discrimination and arrogance here in the United States of America. It not only targets these different layers, but it tells of how an ordinary African-American Person of Color, who is not a celebrity, feels about his own country and the things that molded his life in this country of paradoxes. We all matter and this was written to teach and demonstrate just that. One does not have to be a celebrity to call attention to the ills of our society. Where is the justice that this country so vehemently talks about? Look at the injustices that have been brought against many AAPC in New York City and other parts of this country; you don’t have to live in the south to experience injustice. 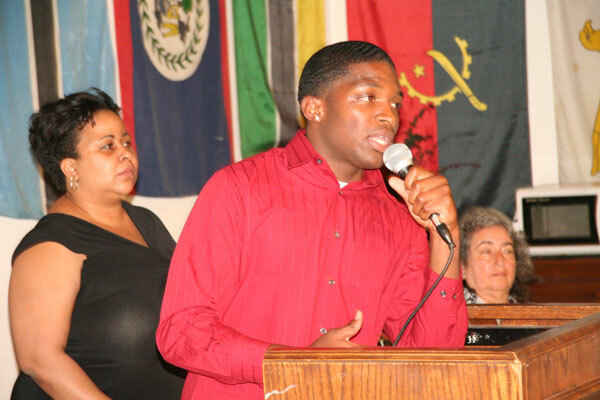 While people of color, the poor and other minorities experience many injustices, it is also evident that gays, lesbians, transgender and bisexual people in our country are experiencing a great injustice too; the author speaks about three minorities of which he knows quite a bit about, being Black, being gay and being an epileptic. Please realize that racism doesn't appear spontaneously out of thin air. When black people stop setting themselves apart and demanding special treatment, racism will end. Jena 6 was a total JOKE! we still laugh about it! And I am not racist but every single one of the kids should have been tried for attempted murder for what those cowards did! But once again, the justice system fails again and falls under pressure to the blacks! Jenna 6 was a moving experience for me as well as theTrayvon Martin case. If the situations were reversed and the victims were blacks there would have been no trials for the white boys. The value of our African American young boys life's is the eyes of white society means nothing. And that's sad. But I will continue to march for my young African American boys/men. We make a difference in this society. Comparing these two cases is asinine. Trayvon Martin was not a criminal; the Jena six beat a young man who had done nothing to provoke them other than be white. He was not involved in the nooses or any other incident; he didn't use racial slurs or anything like that. He simply was a white kid on his way to class. This was a racist attack and a hate crime. Those who rallied for the Jena 6 are hypocrites in every sense of the word. Standing for six racist black kids who committed a hate crime claiming that the criminal justice system is racist. No pun intended, but isn't that the pot calling the kettle black?